Nothing can compare to the flavor of flour tortillas made from scratch. In a large bowl add the flour, salt, baking powder and shortening. Using you fingers cut in the shortening until the mixture resembles pea size pieces. Add the hot water and mix together using your hands or a wooden spoon until the mixtures starts to form. Knead on a floured surface for 5 - 10 minutes or until the mixture is smooth and elastic. Form the dough into a ball. Place the dough into a covered bowl and let the dough rest for 10 minutes. Pinch off the dough into 12 equal pieces and roll each piece into golf ball size ball. Place the balls back into the bowl and cover and let the dough balls rest for 20 minutes. Preheat your griddle or cast iron pan on med - high heat. Flatten each dough ball a bit and then roll out on a floured surface forming a circle. To make a round shape roll out the dough and then make a 1/4 of a turn of the circle and then roll and make another 1/4 of a turn. Keep doing this until the dough is rolled out to 1/8 inch thick. 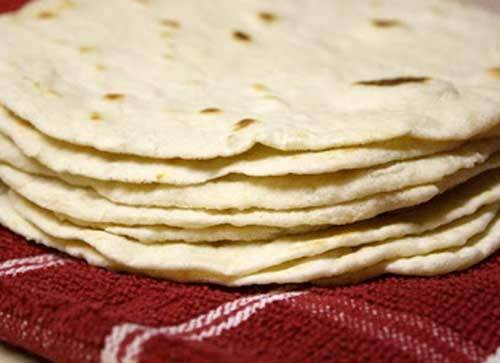 Your tortillas should be thin rather than thick. Place onto the hot skillet, and cook until bubbly. Flip and continue cooking the other side. Each side should cook about 30 seconds. Keep the cooked tortillas warm while you continue rolling and cooking the remaining tortillas. For step-by-step instructions for this recipe and more, visit Mommy's Kitchen.